London Translation has been our preferred supplier for yearly stockholders’ meeting report translation for more than three years. They have always been professional, efficient, and provide excellent quality translations. I would happily recommend them for any translation needs a business or individual may have. We were very impressed with the delivery, the flexibility and the approach. Everything was done according to brief with a polite, yet business-like manner. Over the past year we have used London Translations for dozens of documents often including a degree of technical jargon. They have consistently provided top rate work in several languages and fast. Alex and the team are friendly and very accommodating. I have used London Translations on at least 3 different occasions, finding them to be prompt, professional, courteous and friendly. I have no need to go anywhere else and would have no hesitation in recommending London Translations to anybody needing their services. 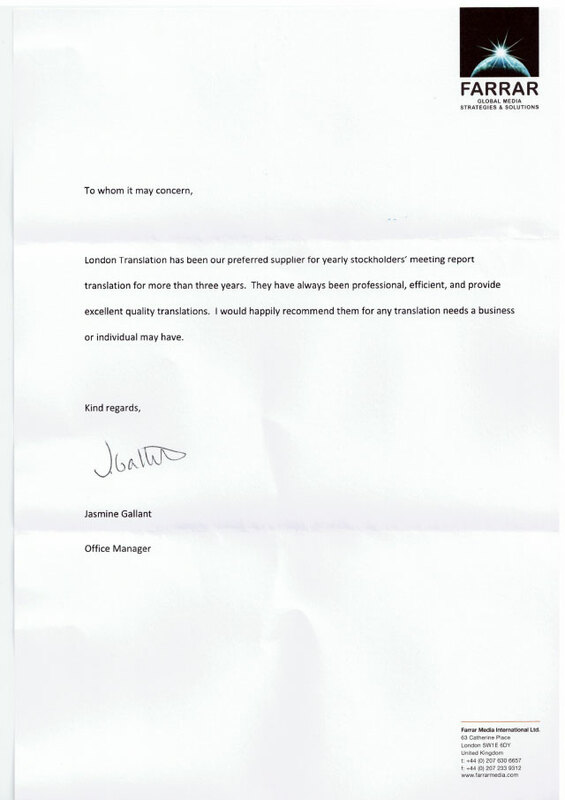 We have had the pleasure of working with London Translations for many years, every time very professional and punctual. The linguistic checks you have done for us over the years are always performed on time, and the delivery is very much up to our expectations. I can honestly say that I was very happy with my recent translation and the service which was provided. Our company regularly use the services of London Translations and from the courtesy and professionalism exhibited by your customer service agents, to the exceptionally quick turnaround time and accuracy of the translations, we have yet to find fault in your service.